Set on the river Dart with steep wooded hillsides on either side, Dartmouth is a town straight out of a picture book. The main embankment runs along the length of the town and provides visitors with a pleasant and relaxing promenade to walk down. From here you will get a spectacular view of the busy estuary and even choose from a number of boat trips, which depart from the waters edge. This two bedroom cottage which sleeps 4 (plus 2 on the sofabed in the lounge if required), has been newly decorated and newly furnished throughout to provide you with comfortable holiday accommodation. 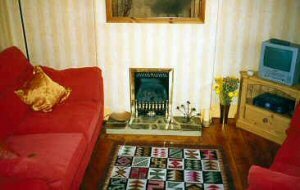 The tasteful, cosy living room with bay window is attractively and very comfortably furnished with one sofa, sofa-bed (double), coffee table, colour TV, DVD player, gas fire and telephone. Natural varnished pine floors with scatter rug and pine furniture all add to the charm of this room. The kitchen is fully fitted with modern units and includes a gas cooker with oven, grill and extractor fan, microwave, a large fridge/freezer and a gas wall heater. All extremely well equipped for up to 8 people and with table and chairs to seat 6. Instant hot water is available via a combination gas boiler. The newly fitted light and bright bathroom has a full size bath with shower, hand basin, toilet, heated towel rails and bathroom cabinet. There is also a washing machine/tumble dryer available for guests to use. Bedroom 1 has a double bed, chest of drawers, fitted wardrobes, dressing table, bedside table and lamp. There is also a TV/video for guests use. 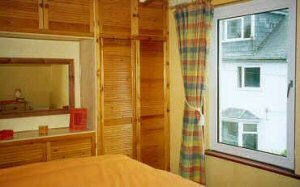 There is room enough to fit a travel cot in this room for families with young children. Bedroom 2 has two single beds, which can be fitted together to form a double if required, pine wardrobe, chest of drawers, bedside table and lamp. All main rooms have natural varnished pine floors with attractive Peruvian and Egyptian rugs to add to the warmth and charm. There are also books and games to borrow. The house also has it's own car parking space a short distance away from the house. It is possible to off load luggage opposite the cottage and then the car can be taken off to the parking space. There is a small enclosed courtyard at the rear of the house with table and chairs and a barbeque for those sunny evenings. There is an optional charge of £20 if guests would like linen to be provided (pillow cases, duvet covers and sheets). Guests must bring their own towels and tea towels. There is also no charge for heating, apart from in winter months. You may arrive anytime after 3pm on Saturday and should leave by 10am on the day of departure. Sorry, no smoking. The cottage is very close to the centre of Dartmouth and is about 200 yards from Foss Street, a pedestrianised street dating from the 13th century. It was built as a dam to hold the Mill Pool. As the water ran out it drove two mill wheels. If you stand about halfway along Foss Street and look towards St Saviour's Church, it's still almost possible to imagine how things might have looked. There are many fine pubs and restaurants, frequented as much by the locals as by the visitors. Among the many shops offering the visitor almost anything he might require, are several specialising in local crafts. 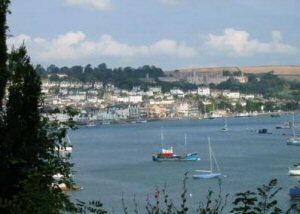 Within the vicinity of Dartmouth are opportunities for cliff walking, swimming and wind surfing at the sandy beaches of Blackpool Sands and Slapton, sailing and fishing, tennis boat trips and bird-watching trips on the River Dart to Totnes and Dittisham. Much of the land in the area is now owned by the National Trust and there are many historic houses open to the public within striking distance of Dartmouth. There are two excellent golf courses within easy reach and of course the Dartmoor National Park is less than an hour's drive away. The harbour is busy with yachts, sailing dinghies and fishing boats of all descriptions, with a full racing schedule throughout the year, which culminates in the royal regatta at the end of August. The town has been carefully preserved and largely restored, with several Elizabethan buildings still standing, almost in their original form. It is a beautiful town, winning prizes for Britain in Bloom competition. The town is a very suitable destination for those without cars. 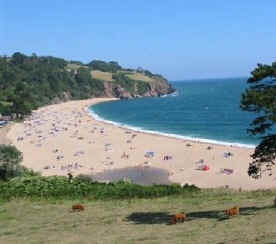 The nearest train station is Totnes which is 25 minutes drive away. It is well served by buses. Once in Dartmouth the amenities are so good that there would be no real need to leave. However, for those that wish to, the town is well served by public transport. Minimum charge applies of £165.